Starting an online business has never been easier than today. With the growth of Amazon, eBay, Shopify, and other online retail platforms, anyone with $20 can start an online shop. That’s where dropshipping suppliers and dropshipping supplier directories come in. 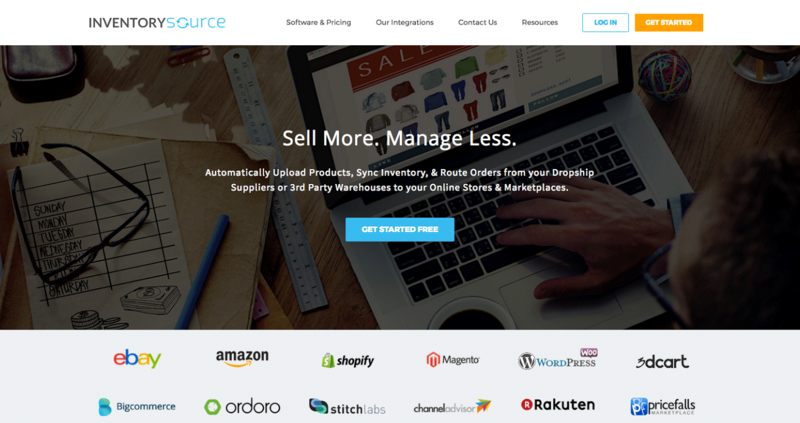 You'll find several ecommerce website success stories about selling online through wholesale dropshipping, so what really is it about? Dropshipping or drop shipping is another name for price arbitrage; a fancy term that means you find low-cost products and sell them at a higher price. When your customers purchase the item, you take their orders and send these to your supplier. The supplier sends out your goods directly to your customers and you keep the difference between what you bought and sold the product for. 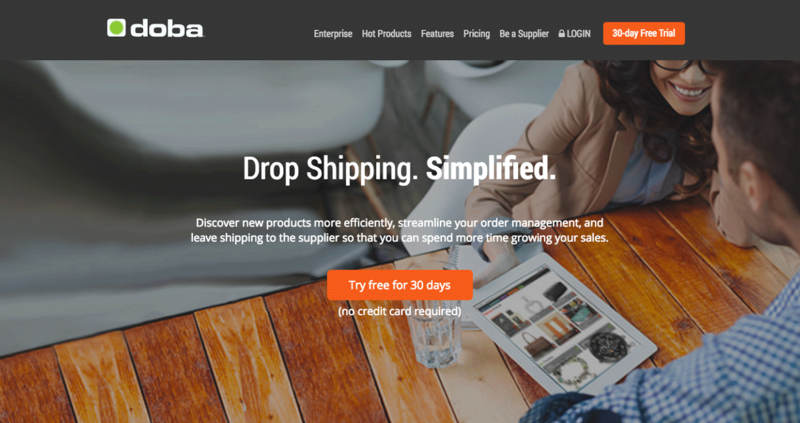 The hardest part of being a new dropshipper is finding the right product and supplier. Not only do you have to find a product people want to buy, but you also need to ensure that your supplier will deliver exactly what you advertise to your customer. This is extremely important because you want to ensure your product arrives in a good condition, meets all of the customer’s requirements, is shipped quickly, and will not be returned. The top suppliers will even include your company’s marketing materials to make it seem as if you sent the product yourself! Working with sketchy suppliers can ruin your business’ reputation or cause you to lose money, so make sure you choose the right supplier or service before you start your business. To help you get started on the right track, we’ve reviewed 12 of the top directories and search platforms. Because they authenticate and vette their suppliers to ensure you only find the absolute best, based on product quality, price, and legitimacy. You get to avoid fraud for pennies on the dollar. What is a Drop Shipping Service/Directory? A dropshipping directory is essentially a giant list of different wholesalers, suppliers, other dropshippers, auctioneers, and other types of people selling goods and products. These sellers pay money to get their company listed on the board of these dropshipping websites and for better visibility so they can be discovered by you, the dropshipper. The other type of sites we reviewed are dropshipping platforms/services such as SaleHoo, Doba, and Dropship Direct. These are online companies that have a directory of verified and authenticated products that you can search through and automatically integrate into your own store - all in just a few clicks. All of the product data, including names, descriptions, specs and images, are “pushed” to your site using software that integrates with your selling platform. Because of this integration, all the back end management can be handled by the service and updated even on a hourly basis. The main difference between a regular directory and a service/platform is that you usually have to pay for the latter on a yearly or monthly basis. But in most cases, the time-saving aspect more than makes up for the costs. Based in New Zealand and started in 2005, SaleHoo is an online directory of dropship manufacturers and suppliers. What makes us one of the best drop shipping companies? Well, we have one of the largest selections of goods from dropshipping wholesalers in the world, and we personally verify each and every supplier on our site to ensure that every product in each of our 75 categories is authentic and legitimate. We also have a broad set of categories including clothes and fashion accessories, electronics, furniture, office supplies, cell phones, and more. And our directory comprises more than 1.6 million products sourced from nearly 8000+ vetted suppliers. With this kind of selection, you’ll be able to quickly find any product your niche requires. Our platform even has specific tools so you can find quality wholesalers who allow low or minimum amount orders. We’re so confident in our suppliers that we fully guarantee their wholesale products in case of defect or scam. Not very many companies offer this type of guarantee. In addition, we also provide you access to our Market Research Labs, an in-depth product discovery tool that allows you to determine with a high probability if your product ideas will sell on platforms like eBay and Amazon, among other sites. To get access to SaleHoo’s directory, there is a yearly $67 USD fee that has to be paid upfront. In case you find it's not a good fit, we offer a 60-day money-back guarantee. We can also build your online store for you for an additional $27 a month. Finally, we have 24-hour chat and email support and a ton of information on how to build a dropshipping business. It’s a great resource and you should definitely check it out. Detailed directory of 1.6 million products from 8000+ verified suppliers. Market Research Labs allows you to browse a huge product selection and see how well a product will sell before you pick one. Lots of free resources to help you learn how to grow your dropshipping company. A bigger focus on small business. Alibaba, the eBay for finding wholesale suppliers in Asia, is not an easy platform to work with if you’re a beginner. Most of the listings are made by manufacturers, not suppliers, meaning they usually have no website, they don’t speak English, orders have to be paid with a wire transfer rather than credit cards, and there is no guarantee you’ll get the items you want. AliExpress, on the other hand, is a sister retail site of Alibaba. It allows Chinese “stores” to sell the goods made by the manufacturers to customers all over the world. It’s like the Chinese version of Amazon, except everything has the lowest wholesale price and packages take 2-3 weeks to be delivered to your door. The good thing about AliExpress is that you can use credit cards or AliPay to ensure safe transactions. Additionally, its rating and review system gives you a good idea about the seller, so you can make an informed choice on which product to buy. 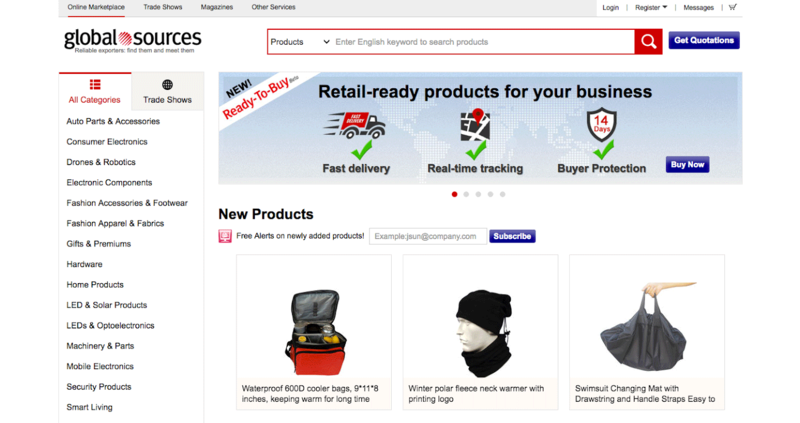 Finding products on Alixpress is a bit like searching on Amazon: You won’t get much information on what’s hot and popular. There is no search engine to determine which products will be good for your niche. You have to do this work yourself. The great thing about AliExpress is that it’s free. Unlike some of the other best drop shipping companies we've listed here, there are no upfront costs or monthly fees to join AliExpress. Surprisingly, AliExpress support is actually pretty good. We’ve contacted the site several times about issues with payment and shipping and it provides round-the-clock service. While it can’t provide super in-depth information about specific problems sometimes (customer reps just say it will take a day or five days to fix with no timeline), the site does solve problems eventually. The biggest benefit of working with AliExpress is that you can use the Oberlo integration with your Shopify store. This automates your sales process, reducing the need to manually submit an order to your suppliers. The downside to AliExpress is that shipping takes at least two weeks to get to the United States and can extend to more than a month for other parts of the world. This can be a barrier to a lot of sales and could drive traffic away from your business to a site like Amazon, where consumers could pay a little more and get the item within a day or two. Additionally, because you are dealing with separate sellers, you won’t have the option to bundle up multiple products if they’re sourced from different suppliers. Some customers may not like getting one package one week and then two more the next. You need to be clear when setting up your site, detailing all of this shipping information. Overall, AliExpress is a decent option for beginners. There are no upfront costs, you get buyer protection, and its rating system makes it easy to choose a good supplier. However, you must deal with communication barriers, variable shipping costs, and potentially fraudulent orders. Note: You can also check out other AliExpress alternatives here. Very cheap to get started. It’s easy to integrate into Shopify with third-party tools like Oberlo and Shopified App. It has multiple suppliers and a huge product selection. Supplier quality can be mixed. Shipping times can take upwards of a month in some cases. You’re not dealing with the manufacturer, only third-party resellers. 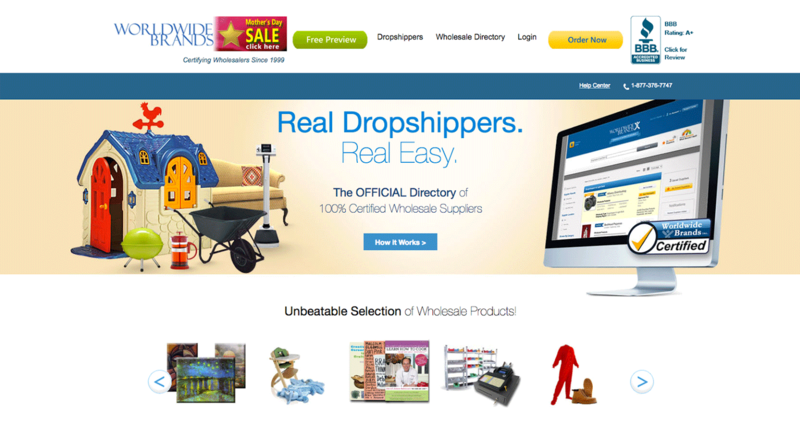 Worldwide Brands is the “grandfather” of wholesale supplier directories, founded in 1999 by eBay Powerseller Chris Malta. Like SaleHoo, it has verified and vetted each one of its 8000+ suppliers. It does this by meeting the companies at trade shows, visiting their factories, and seeing for themselves that the products being offered are legitimate. The biggest hurdle for WWB is that it has a one-time lifetime membership fee of $299 USD. While in the long run, this may actually be less than other paid sites like Doba and SaleHoo, for many the upfront cost will be too big of a barrier to join. What WWB provides, though, is a comprehensive directory where you can search for products from a regularly updated list of verified suppliers. A query will return supplier information, such as the company name, website, full address, phone number, and all other payment and ordering details you will need for placing your order. The issue for dropshippers, also known as Light Bulk Friendly on WWB, is that prices offered for low or no-minimum orders can be unprofitable unless you are making large purchases. You may not get a discount big enough to be very profitable on eBay or Amazon. One thing that can be annoying for wholesale dropshippers is that WWB tries to upsell you on every additional service other than the directory. It has a partnership with other sites like Quickbooks and Sell-Niches.com, both of which give WWB a commission if you use their services. While pushing for affiliate sales may be a good marketing strategy, the $300 upfront fee should give subscribers more access to affiliate-free quality content. WWB provides some support for its members, but it’s not anything you couldn't learn elsewhere on the internet - things like how to find a niche, how to choose the right supplier, how to set up your legal business, etc. If you want more you have to buy into one of its expensive upsell products. Overall, WWB is more for those making large orders and have significant ecommerce experience. It’s not a place for beginners and you would be much better off trying out one of the other sites. It has a detailed directory of 1.8 million goods. It's created by an eBay powerseller for people who have wholesale and dropshipping companies. Easy access to supplier info and goods, so you can get the best dropship experience. Upfront $299 lifetime fee blocks small businesses from being able to afford it right away. Some suppliers have high minimum orders in order to get low prices on goods. Constant affiliate marketing and upsell offers can get annoying. 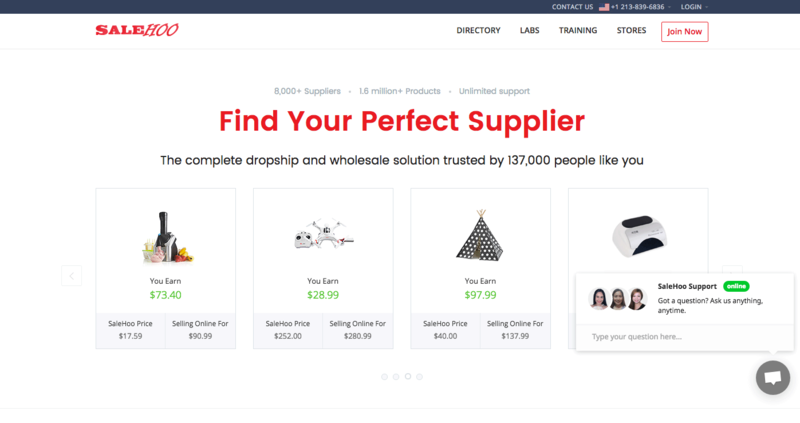 With more than 100,000 products sourced by more than 900 suppliers, Dropship Direct provides a robust directory for you to build your dropship business with. While this may not seem like a lot in comparison to some of the other sites reviewed here, its product selection is pretty robust. Dropship Direct excels with its transparency and back end data feed management. Dropship Direct is very open about the pricing of its products. Once you’re approved for an account you can inquire about the Minimum Advertised Price of a product. This means you’ll know exactly how much you will pay for each unit. There is no ambiguity. Its PushList data feed technology is the best out of all of these services. You can use it to customize data feeds for a host of markets to include Amazon, eBay, Shopify, etc. These feeds contain all of the info used in the creation of your listing, including photos, descriptions, specs, and more. Additionally, all products sourced through Dropship Direct are delivered blind, meaning that there is no promotional material inside and it appears as if you sent the package yourself (also called “white labeling”). You can even have your brand materials included with the packaging slip. This gives you a more personal feel. Additionally, Dropship Direct handles all of the logistics when it comes to shipping, including flat rate pricing for more than 20,000 products. The directory is free to join. The application process takes a few days, but once you are certified, you get access to its large database of products as well as tutorials on how to use the service. In order to get the PushList back end management system, you either have to pay $37 USD a month or average more than $1,000 in orders. Premium members get access to better inventory automation, restricted product lines, and more in-depth statistics. In case you need support, it’s easy to get in touch with its service reps, either by email or on the phone. The company's phone lines are open from 10:30 a.m. to 4:00 p.m. PST. This is another good service for beginners because of the low upfront costs. While the directory may have a smaller selection compared to other sites, its service and back end management more than make up for it. Pushlist technology means it has one of the best back end management systems. It can deliver blind, or white label, products. It's pricier than other services. It has a smaller catalog of goods to choose from. 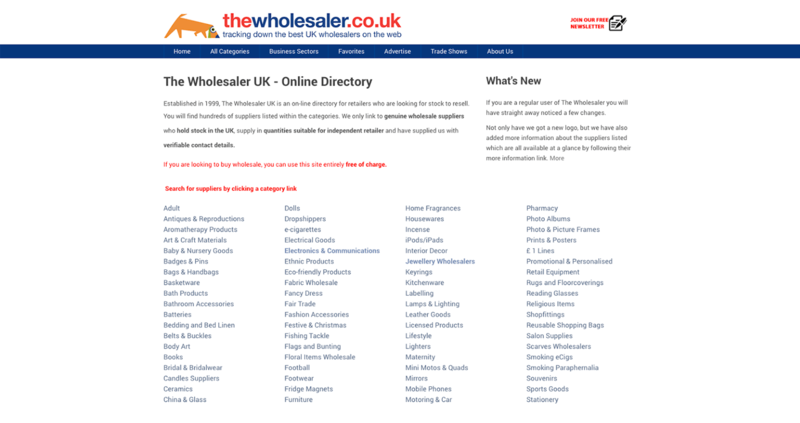 TheWholesaler.co.uk is the largest UK-based wholesale directory and it’s free for anyone who wants to find drop shipping wholesalers in the UK. The directory is large and divided into subcategories. The site's functionality is limited, however, since it’s just a listing board for wholesale companies. You won’t find individual products; instead, you’ll get info about different companies and then be directed to those companies’ sites to see their merchandise and contact info. The good thing about TheWholesaler.co.uk is that all of the companies listed are UK-based and a few companies will even provide wholesale supply of licensed products from companies like Disney. If you are based in the UK, definitely check it out. For anyone outside of the UK, check out some of the other options listed here. Possibly the largest database of UK-based suppliers. It has access to licensed goods (like Disney). Its customer support leaves a lot to be desired. Its ecommerce platforms require a lot of searching and calling, since it's not easy to communicate with suppliers. 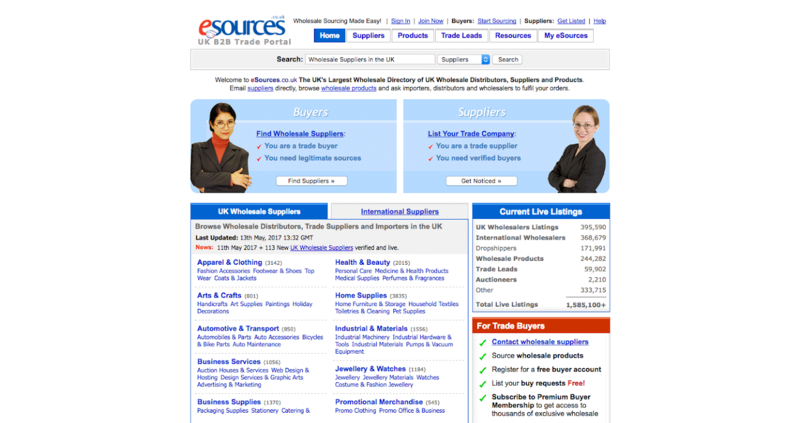 eSources.co.uk is another UK-based wholesale directory. 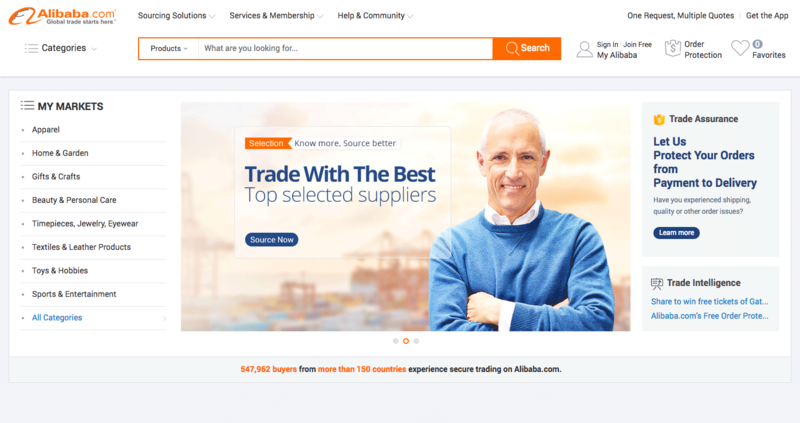 Boasting over 350,000 different domestic wholesale listings and more than 170,000 dropshippers, it’s one of the largest portals for UK wholesale distributors, suppliers, and for other products. One benefit that eSources offers is its TradePass company verification system. If a company has the TradePass logo next to its name, it means the company has been authenticated and verified by eSources.co.uk and the owners and employees of the company are who they say they are. In order to get access to the company listings, you have to create an account. If you’re only planning on buying products, it’s free to sign up. However, if you want to contact companies directly and gain access to eSources.co.uk’s database, the subscription cost is £20 a month, £50 for six months, or £75 for 12 months. If you are based in the UK, using eSources.co.uk will be an attractive offer because of its broad database and domestic access to goods. Companies can be verified and given the TradePass badge. It has a lot to offer for UK dropshippers. It charges membership fees for some buyers. 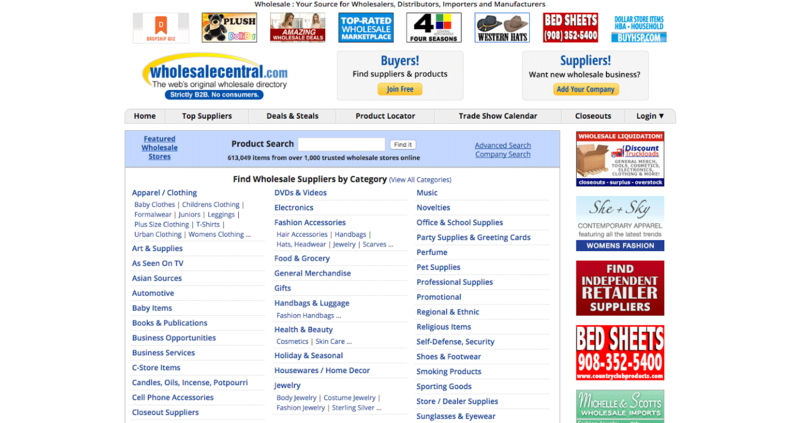 As one of the oldest wholesale directories, WholesaleCentral.com provides free search and contact options to buyers looking to find suppliers. Wholesale Central is an offshoot of Sumner Communications, Inc., a trade magazine publisher. Like a trade magazine, the site makes its money by selling listings to companies. No registration is required to access the database and search for dropship products to sell. However, if you do create an account you get access to its “Product Locator Service,” trade magazines, and its list of trusted suppliers. If you’re ready to look through its directory and reach out to companies yourself, you may find some good opportunities. Check it out, but be prepared to put in a lot of work. It makes ecommerce selling easier with its large selection of suppliers. It's one of the older supplier directories around. It requires a lot of work to connect to the suppliers. It may not be good for beginners. 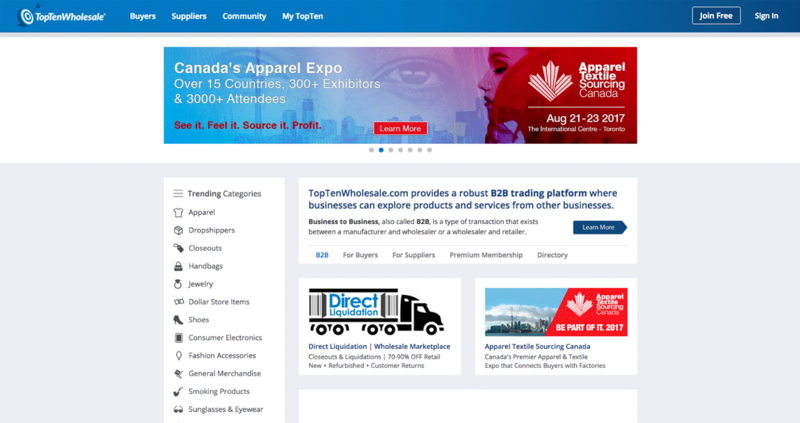 As one of the leading whole trade platforms, Toptenwholesale.com connects buyers with wholesale suppliers, importers, distributors, and other resellers of both new and used products. Like the previous few sites, it’s a trade board, meaning it only has listings for products and suppliers. The products are laid out pretty clearly and it’s easy to navigate, but it lacks a lot of the refinement seen in some of the top wholesale sites. One of the issues is that a lot of the products can only be bought in bulk, so it may not be the best for dropshippers. It’ll be tough for beginners to navigate because, while it's laid out well, someone who doesn’t have a lot of industry knowledge will have a hard time contacting the suppliers one by one. Toptenwholesale.com does provide verification for some of its suppliers and products, so you know you are getting a legitimate authentic product. It also sources from many U.S.-based suppliers. It has multiple suppliers from the United States, which can be an advantage. Its detailed directory is laid out very cleanly. You can only buy in bulk for most products. Because of the poor navigation and filtering, it’s not beginner-friendly. Globalsources.com is a wholesale site based in China that’s solely focused on large-amount orders. The site has a large collection of goods and suppliers, but there is not an option for low- or no-minimum orders. This site isn’t geared toward dropshippers. It’s better suited for those who want to buy in bulk or need private label goods created. It’s good for wholesalers, since it offers a detailed directory and product selection. It offers white label for better branding. It's based in China, which means high shipping times on products and a communication barrier for most of the world. It only allows bulk orders. It's not for dropshippers with only a few orders. Inventory Source is a dropship service software that has robust inventory and back end management features. It’s also integrated into all of the major ecommerce sites like Shopify and Big Commerce. With more than 1 million products available from over 100 suppliers, you’ll definitely be able to find the right fit for your niche. Inventory Source’s powerful software allows you to export product descriptions and images to your site with the click of a button. If you don’t have a site, the service can build one for you. One thing Inventory Source can’t do is ensure that your orders can be combined together. That means you’ll have to contact sellers directly to discuss bundling your goods. With Shopify, you can choose from a list of pre-integrated suppliers. Customers have to set up a reseller account with each supplier though, and pay a diminished price for each additional supplier. One of the best things about Inventory Source is its customer service. The company will go above and beyond for its clients, answer every question, and even provide advice on best practices. To sum up, Inventory Source is great if you have multiple suppliers and want to integrate them all into one feed for your store. This back end management is key for dropshippers to focus on what matters most: making sales instead of inventory management and product updating. If you want to pay per supplier rather than per 1,000 items of products sold, Inventory Source is your best bet. Its pushlist technology makes it very easy to integrate products with your store. You get access to integrated suppliers. Its fees are based on supplier count, not goods sold, which means you don’t need to pay a portion of your sales. Its fees can be high if you need access to a lot of suppliers. It’s not as easy to find the right suppliers to work with. Doba is one of the biggest dropship services and is based in Utah, USA. It aggregates products from suppliers and acts as a middleman so you can easily find new products and wholesale dropshippers from the USA. It also offers the biggest selection and most comprehensive back end management system, but its plan subscriptions could be pricey. Doba has more than more than 2 million products from over 200 suppliers aggregated in its database and has the largest product offering on the internet. Using Doba is extremely simple. Its user-friendly UI makes finding products and exporting them to your store super easy. Doba supports all of the major ecommerce platforms in its data export process and can even export lists in CSV or XML. Additionally, Doba has a robust inventory management system that will tell you when you’re running low on a certain product or if the description has changed. Doba is one of the most expensive services, though. The $29 USD per month for the basic plan (which gives access to the database and support network) could be a higher cost than some beginner dropshippers want to pay. However, the more expensive plans offer greater functionality, such as Amazon Data Export and batch order uploading. Doba also has great customer support. If you have any questions, the company will quickly get back to you. For more expensive accounts, it even offers 24-hour telephone support. After you sign up, you’ll even be contacted by a support representative who will help you set up your account and get the ball rolling. To sum up, Doba offers great support, tons of products and suppliers, and has the best back end management system. However, this all comes at a cost, which could be prohibitive to beginners. Doba is a good platform for more experienced dropshippers, but those starting out should try other services if startup costs are an issue. Its database consists of more than 2 million products. It uses pushlist technology, which integrates with Amazon, eBay, and Shopify. It provides amazing customer support. High fees, which put a barrier to entry for small businesses. It has fewer suppliers than other directories on this list. If you want to focus solely on consumer electronics and video games, Megagoods is the hub for you. Based out of Los Angeles, in USA, this wholesale dropshipper only has around 2,000 products, but is hyper-focused around one niche, which makes up for the lack of goods. The site does not have broad search functionality, which limits its usefulness. One of the better benefits of using the site, however, is that it will blind-dropship your goods, using your own brand name so the customer doesn’t know they were sent goods from a third party. It has a good shipping policy, delivering items in 1-2 days with tracking on all shipments. US dropshipping suppliers can offer a variety of shipping types using FedEx, UPS, or USPS, so you can also have control over shipping fees. Additionally, its return policy is pretty robust for a consumer electronics dropshipper. It offers a 30-day guarantee against manufacturer defects from the date of delivery on most products. You can also export its products to your store, but bear in mind there are only a few file types and it may not work for your site. Images come as a ZIP file and have to be manually sorted. Becoming a member of Megagoods gives you access to better pricing and restricted goods. The cost of a membership is $14.99 a month. This is low in comparison to some of the other sites we reviewed, which may make it a better choice for you (assuming your niche is consumer electronics and video games). In addition to the monthly payment, there’s also a $1.50 surcharge for dropshipping an item. The company also charges a 20 percent restocking fee on all unwanted returns. All in all, it's a good dropshipping service if electronics are your niche. However, if you want to sell more than just this, check out another one of the services we reviewed in our guide. It's a dropshipping supplier from USA, which means you can advertise U.S.-made products. The fees are pretty cheap. One of the biggest issues when looking for wholesale dropshippers is fraud. There are a lot of dropshipping companies out there that are just looking to take your money. They could sell low-quality goods or even not ship anything at all. Supplier directories help avoid these fake dropshippers so you can rest easy. For more on spotting fake dropshippers, check out our full guide. Just because directories make it easier to find a good supplier doesn’t mean they’re the only way to do so. Additionally, finding a supplier is only half the battle. What do you do if you’ve found five solid suppliers and aren’t sure which one to choose? 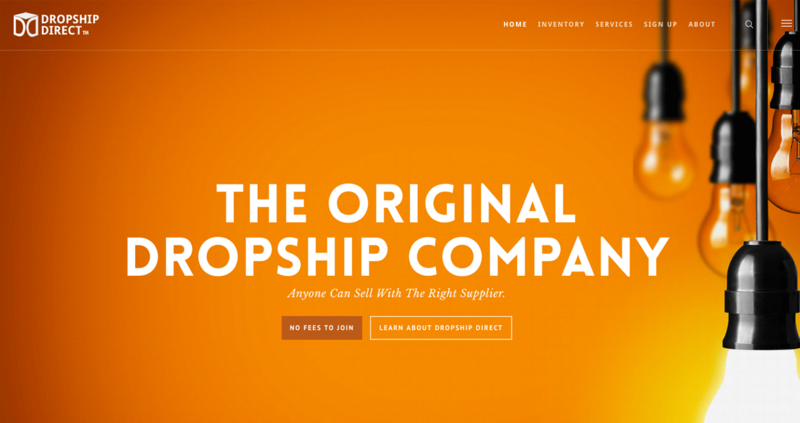 We wrote a full guide to help you how to find dropship supplier (with or without a directory) and choose them based on price, product quality, and more. Finding quality products and reliable suppliers is the most difficult part of dropshipping. If you want to open an online store, using a dropshipping directory is the easy, quickest, and safest way to find suppliers. With the top 12 supplier directories on this list, you’re sure to find one that’s a great fit for you. Is there a directory you’re wondering about that we didn’t cover? Let us know in the comments below! That page has a quick overview of the steps involved in dropshipping, and you can click on each step to be taken to an article with an in-depth explanation of that topic. Is it necessary to have my own website? Isn't it good to work on Facebook instead of opening a website,? Hi Momo! It isn't necessary to have your own website, but you'll definitely want to use more than just Facebook for dropshipping. I would recommend selling on eBay and Amazon and supporting those stores through Facebook, and opening a site of your own once you've gotten established. Wow, helpful information. Looking to start an ecommerce store that sells quality children's clothing from sizes 0-20. I would love to find suppliers that are in the United States. hi, i am a Salehoo account holder and running eCommerce store from the last couple of months but recently i launched another website so can i use the same account for another website? or i have pay again for using your drop-shipping products list to my another website. However i found an article with who write an review on you https://www.withintheflow.com/salehoo-review/ but they didn't mention about this service and i have also checked all pages of your websites but didn't got the answer of my question. Very informative, am thinking about getting involved in drop shipping, but how do combined goods when your customer place numerous order, and it from possible from 4 different supplier? You have very limited options here. Most of the time, sellers doing drophipping create a method wherein they analyze which courier would be taking the longest shipping time, the most expensive shipping cost and develop their own uniform warranty policy so to have a uniform structure across all suppliers. This way, if you have suppliers that ship quicker than others, then those customers will get the items quicker than they expect. hello If I live in UK I can do this? Yes, you can definitely do dropshipping even if you're in the UK. Most dropship suppliers can deliver items internationally so that's not a problem. Hi Miriam! You can refer to this article here to give you an introduction on how dropshipping works: https://www.salehoo.com/dropship - hope this helps! The suggested list gives you unbiased reviews of each. This will definitely help retailers decide which path to take on.